Uneven concrete slabs and flooring can create drainage problems or make it difficult to lay new flooring on top. Garage flooring often has a slight slope or incline, but you can fix this a few different ways. Leveling compound is specially designed for evening out a small slope in concrete. For more serious slope fixes, a combination of leveling compound and cement evens out the surface. The result is a level floor that you can refinish and use as a base for new laminate, wood or tile flooring. Remove all items, including boxes, furniture and anything obstructing the area to be leveled. 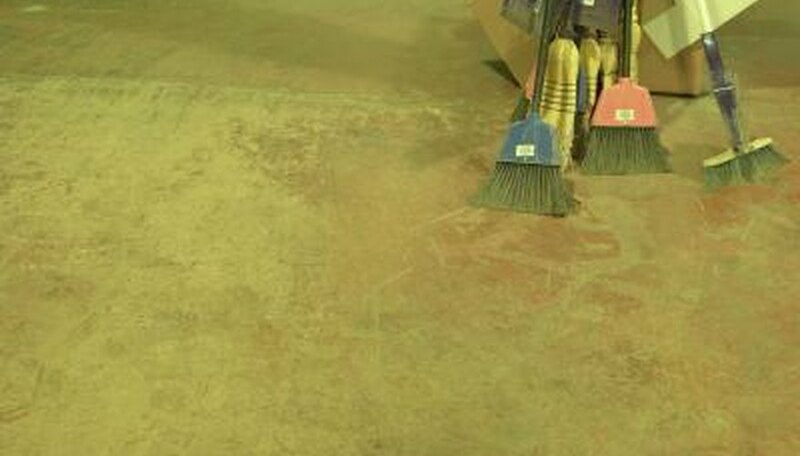 Sweep away dust and debris. Fill any cracks in the concrete with a liquid crack filler. Use a putty knife to push the liquid into the crack and wipe away excess. Grind down bumps and imperfections in the concrete with a concrete grinder, if necessary. Start the grinder before placing it against the floor. Then move the grinder from side to side against the floor. This allows for an even finish without inconsistencies. Make sure you review manufacturer instructions for the grinder. Some models require a slightly moist surface for use. If there are only slightly raised areas, you can skip this step, as they will be smoothed out with the leveling compound. Apply expansion tape around the perimeter of the slab by placing it at the wall's base where it meets the floor. This creates a barrier and seals the joints of your floor. Clean the surface of the slab with a phosphoric acid-based concrete cleaner. This removes chemicals, oil and other substances that could interfere with adhesion. Prepare a concrete mix according to manufacturer instructions, if you need to raise the slope more than half an inch. Otherwise, you can skip this step and proceed to applying the leveling compound. Pour the cement until it is a half-inch below the necessary level. Even out the cement with a trowel. Let dry for at least two hours before pouring the leveling compound. Prepare the leveling compound according to manufacturer instructions. Pour the compound and spread with a squeegee or trowel until you achieve the desired level and slope. Follow manufacturer guidelines throughout the process. An application of a bonding chemical will help cement adhere to the existing slab. Use caution when working with phosphoric acid or other caustic concrete cleaners. Avoid contact with skin and eyes and keep the chemical out of reach of children. Wear protective clothing and acid-resistant gloves to prevent skin contact with the acid. For extra protection, wear safety goggles.